With over 100,000 copies sold since first publication, this is one of the most popular astronomy books of all time. It is a unique guidebook to the night sky, providing all the information you need to observe a whole host of celestial objects. With a new spiral binding, this edition is even easier to use outdoors at the telescope and is the ideal beginner's book. 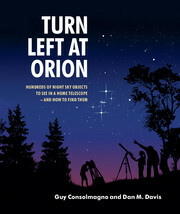 Keeping its distinct one-object-per-spread format, this edition is also designed for Dobsonian telescopes, as well as for smaller reflectors and refractors, and covers Southern hemisphere objects in more detail. Large-format eyepiece views, positioned side-by-side, show objects exactly as they are seen through a telescope, and with improved directions, updated tables of astronomical information and an expanded night-by-night Moon section, it has never been easier to explore the night sky on your own. 1. How do you get to Albireo? 11. Where do you go from here?